Because the Stassen’s won the last cook off, they hosted this most recent one and the theme they chose was Mexican. We had the most wonderful day and we even had a guest team…Team Taylor…. joining us from South Africa. So without further a do, I present to you the Mexican cook off!! We started the day off with some nachos and desperado’s. It was a lovely warm day so we ate these outside watching the kids run about in the garden. There was a delicious, spicy guacamole and sour cream for dipping. What a great start to the cook off and a great scene setter for what was to come. So, this team kicked off the challenge by going first. They did burritos filled with slow roast beef, spicy rice and topped with tomato and cheese. They made a home-made tomato salsa for dipping with guacamole and sour cream. The juicy beef just melted in your mouth and the spicy tomato rounded this dish off perfectly. What a fabulous dish! 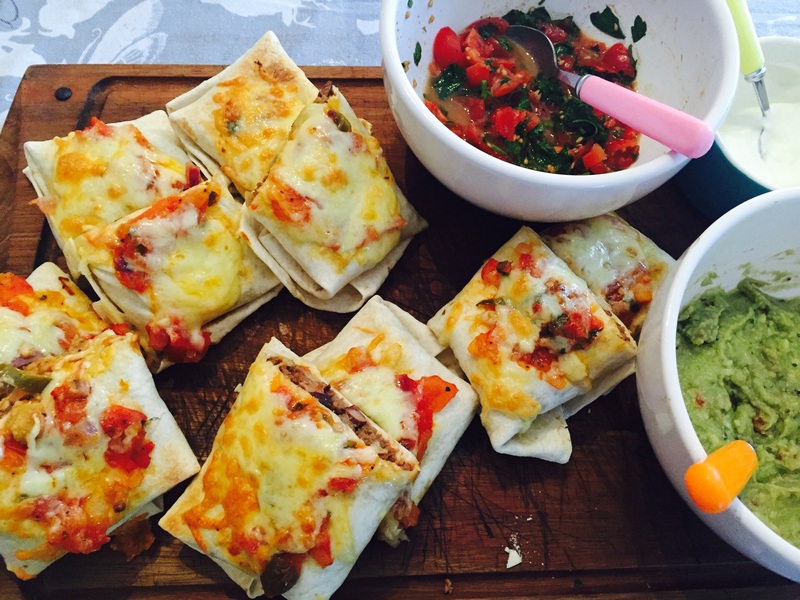 The Stassen’s were next with chicken quesadillas with chorizo, cheese and chilli and home-made guacamole and chilli sauce for dipping. 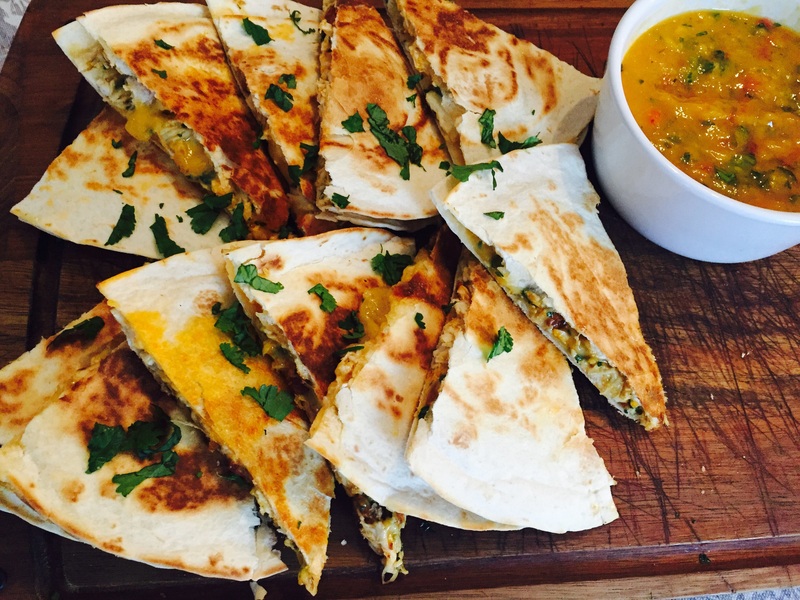 Crispy, spicy and cheesy… all the good things you expect from a good Mexican dish. Lip smackingly good and so easy to make, it would literally take you a few minutes to rustle up! So our lovely guests, Mr and Mrs T contributed to the day and seeing as they were there for the very first cook off (steak) it was so fitting to have them join us for this one. 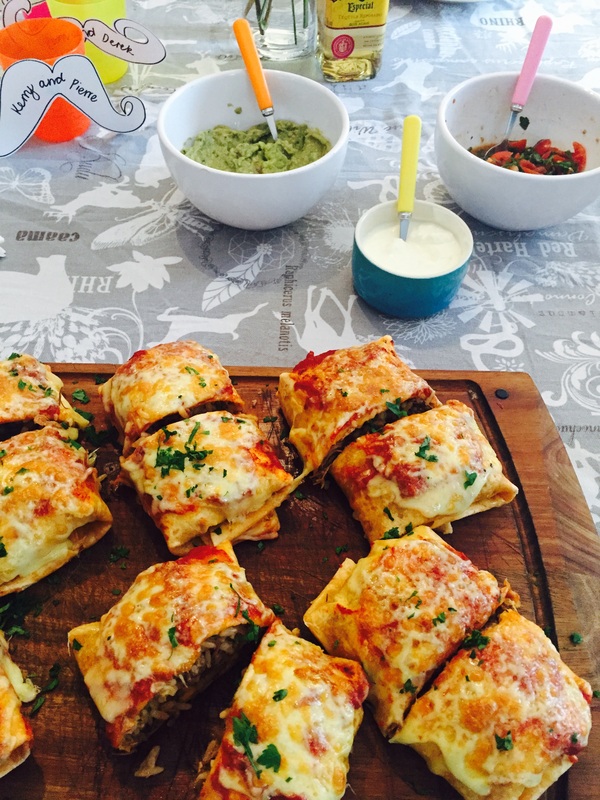 On this occasion, they presented mince Chimichangas. They are traditionally deep fried but on this occasion we had them soft and gooey. They were filled with spicy mince and refined beans with a home-made chilli sauce for dipping. The mince and beans were such a good combination and the chilli sauce just added the kick you needed at the end. They were absolutely delicious and I would love to try their fried counterpart too! So this team is always the one to watch and this was no exception! 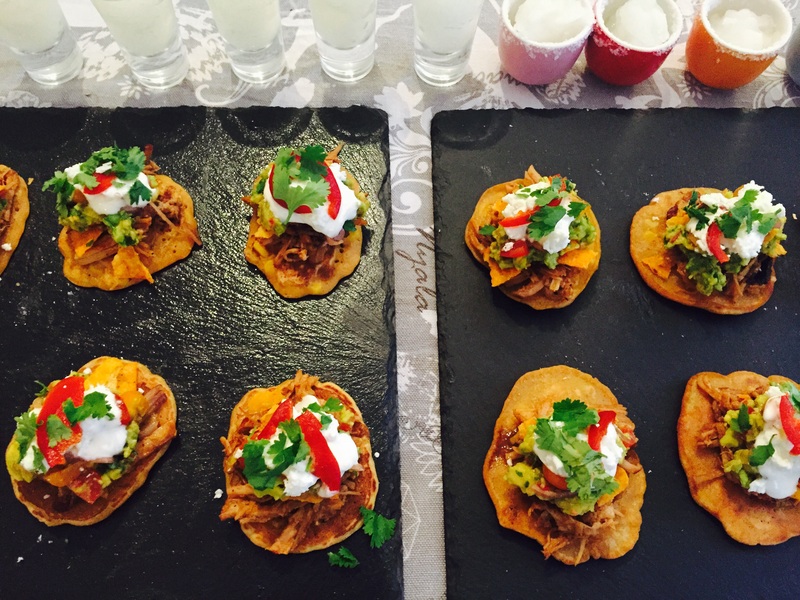 They did beautifully plated sweetcorn fritters, pulled pork, crushed tortilla chips, feta and a sprinkle of chipotle chilli. so so good! The feta added a depth to this dish that was instantaneous! Such a lovely combination of flavours! We were so stuffed by the end of the day we couldn’t eat another thing but what a fabulous afternoon! Good food, good friends and lots of laughs. The voting for this one was nerve racking! I personally didn’t think my dish was that good and the Breetzke’s were ready for a win. 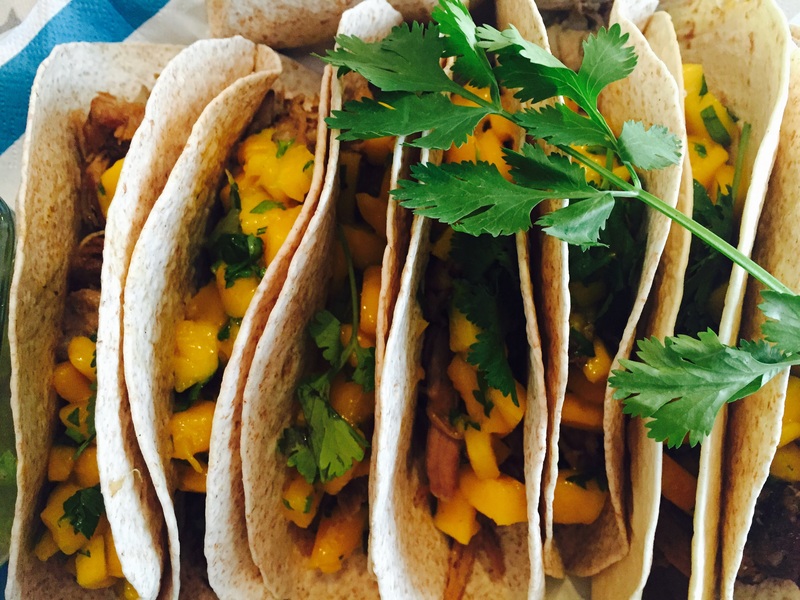 After counting, the Stassen’s gave us the great news that the winner of the Mexican feast was….. They took home the small roaming trophy and a bottle of tequila. Well done guys! A very well deserved win and we look forward to what you have in store for us at the next cook off! Keep an eye on the recipe tab of the blog for some recipes from the day. If you want one in particular, do contact me.